Dell Certified Refurished Monitors, What Does That Mean? As a Dell Authorised Partner we are regularly supplied monitors which are classed as a Dell Certified Refurbished Product. We understand that term “refurbished” can be off putting as we have many enquires as to what this means as many think that these are previously used items which have been cleaned and re-packed but this couldn’t be any further from the truth. We have put together a few questions and answers giving you a full insight into a Dell Refurbished Monitor. What is a Dell Certified Refurbished Monitor? It is an item which has been returned to Dell for a number of reasons but the vast majority come from large cancelled orders from businesses and not returns from individuals. 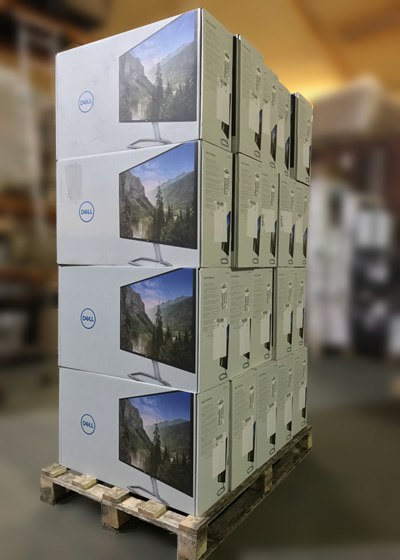 For example, if a company were to order a batch of monitors and on receipt realise they have ordered the wrong model Dell would collect the monitors and as they don’t know if they have been previously opened they are put through the refurbished process as Dell don’t put any returned items back into new sales stock. What is the Dell refurbishment process? When they are returned to Dell some boxes may have been opened and some will still be factory sealed, if they are factory sealed they are put directly on pallets and shipped direct to us. This is how the majority of monitors are sent to us. If the box has been opened so the factory seals have been broken a Dell engineer will firstly unpack the item, it will then go through a stringent quality check and once it has passed these checks it will cleaned and repacked into it’s original box included all it’s original cables. If the original box has been damaged the monitor will be packed in new Dell packaging. So the monitors are not actually refurbished? That is correct, if an engineer tests a monitor and it doesn’t pass the quality check they are scrapped and not repaired. As Dell supply these to us as refurbished we have to advertise them as Dell Certified Refurbished on our website. Why do you have items marked Factory Second? During the Dell refurbishment process if a unit has a cosmetic mark (i.e. mark to the stand) it is noted. When we receive these monitors we do open the boxes so we can thoroughly check and then when we advertise them on our website they will be advertised as “Factory Second” in the title and we include a report description on the page of the item. We are very thorough with our checks and many times a cosmetic mark is hard for the customer to see. Why is there no Dell warranty on these monitors? Dell don’t supply any of these monitors to us with the manufacturer’s warranty as they are unable to reset the warranty start date so they remove the warranty from the unit. Due to this we add our own comprehensive warranty.